I love marshmallows... and I love creating in the kitchen, with my Mom. We had pretzels on the counter and my little sister was into the marshmallows. We are getting ready for our own party on Halloween so I told Mom about the idea and she helped me get the ingredients out and I put these together. They look inviting, taste delicious and hey - even a 6 year old can make them! Melt chocolate in microwave (about 2 minutes on high). Stir until smooth. While chocolate is melting, carefully stick 4 pretzel sticks on one side of the large marshmallow and 4 pretzels into the other side of the marshmallow. Place wax paper on a cookie sheet. Place marshmallow 'spiders' on the cookie sheet. Spoon 1 generous tablespoon of melted chocolate onto the white marshmallow to cover up and make the spider's body. Use red hots for eyes and, if you want a black widow... don't forget to put a red hot on the underside of your spider! If you want 'double chocolate' why not use chocolate marshmallows? Be creative... Once all the spiders are covered with chocolate, place your sheet in the fridge or freezer to set the chocolate. 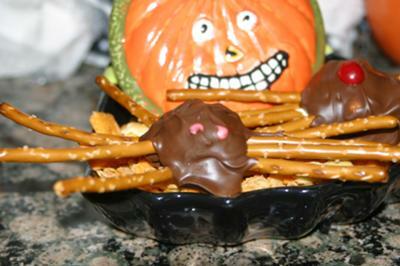 Once the chocolate is hard... they are ready to be the "Eeekkkk" at your Halloween party! I won't invite our friend Black Beauty to sample these scary black, red spotted arachnids because you know what he'd do to them, and that wouldn't be pretty ! ! ! Its the best! I love it! Fantastic! Quick, easy, tasty treat! Thanks for being creative and sharing your recipe! Can't believe I didn't think of this - what a great idea! Great idea--and thanks for letting me be a taste tester! Let me know when you're ready to start giving cooking classes--I'll be the first to sign up! 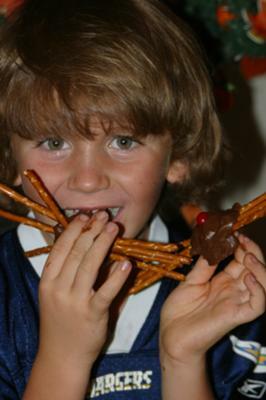 Pretzels and chocolate! Great idea! 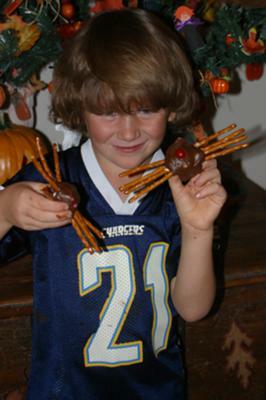 Chase, I can't believe you are on the world wide web. You are on your way to a master chef career. We love the Spiderliciousness of your recipe. Way to go Chase, great job! Thanks for sharing such a fun recipe. Looking forward to serving these at 'our' Halloween party! Love them they're very clever. Love Las Vegas too.